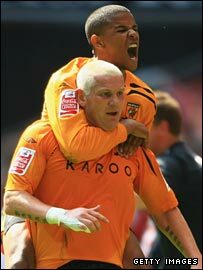 Dean Windass volleyed Hull City into the Premier League for the first time in the club's 104-year history. The 39-year-old striker's spectacular first-half shot from 18 yards was enough to beat Bristol City in the Championship play-off final at Wembley. Bristol City pressed after the break, with Hull keeper Boaz Myhill saving from Lee Trundle and Michael McIndoe. Michael Turner also blocked Trundle late on as the Tigers held on to join West Brom and Stoke in the top flight. It was a moment of triumph for Hull boss Phil Brown and his players, but it will be veteran Windass who will claim the glory after hitting the winner on his first appearance at Wembley in a long and distinguished career. even a born optimist and enthusiast such as Windass could only have dreamed that the journey would end with a return to the Premier League. And the scenes of jubilation at the final whistle showed what it meant to Hull's supporters as they savoured the prospect of welcoming the cream of the Premier League to the KC Stadium. For Bristol City and boss Gary Johnson there was only misery as they were on the wrong end of a fairytale for Hull and Windass and they must now regroup for another season in the Championship. Bristol City opened with greater purpose, and midfield man Nick Carle might have done better than shoot wide after working his way into the Hull area. But Hull responded and Richard Garcia headed just over from Sam Ricketts' cross in the 19th minute. The Tigers took the lead in stunning fashion seven minutes before the interval - and it was no surprise that it was the evergreen Windass who was the scorer. Fraizer Campbell was the creator with clever work in the area and a cross to pick out Windass, who volleyed superbly past Adriano Basso from 18 yards. Bristol City suffered another setback before the interval when Bradley Orr, who had been injured in an accidental clash of heads with Nick Barmby, went down again and there was a lengthy stoppage while he received oxygen before being stretchered off. It meant there was nine minutes of injury time in the first period, with Orr being taken to hospital with a suspected depressed fracture of the cheekbone. Bristol City pressed after the break, but found Hull's defence in resilient mood as they looked to hang on to the precious Premier League prize. And Hull made their usual changes as time went on, with Barmby replaced by Craig Fagan after 66 minutes and Caleb Folan replacing goalscorer Windass four minutes later. It was the signal for a renewed period of Bristol City pressure, with Lee Trundle forcing Myhill into a save after a mazy run and Michael McIndoe testing the keeper from long range. Trundle was left in anguish again six minutes from time when he looked poised to score, but Turner threw himself in front of a goal-bound shot to keep Hull in front. Hull and their supporters were kept waiting by five minutes of injury time before their place in the Premier League could be confirmed, but there was ecstasy when referee Alan Wiley blew the final whistle - with Windass racing on to the turf and slumping to his knees in joy. Bristol City: Basso, Orr (Johnson 45), Carey, Fontaine, McAllister, Noble (Sproule 63), Elliott, Carle (Byfield 76), McIndoe, Adebola, Trundle. Subs Not Used: Weale, Vasko. Hull: Myhill, Ricketts, Brown, Turner, Dawson, Garcia, Ashbee, Hughes, Barmby (Fagan 67), Campbell (Marney 90), Windass (Folan 71). Subs Not Used: Duke, Doyle. BBC Sport Player Rater man of the match: Hull's Dean Windass 8.24 (on 90 minutes).